This mixed use development consists of four hotel levels, with retail space on the ground floor, and five levels of private residences, above the hotel, all constructed over four levels of subgrade parking. 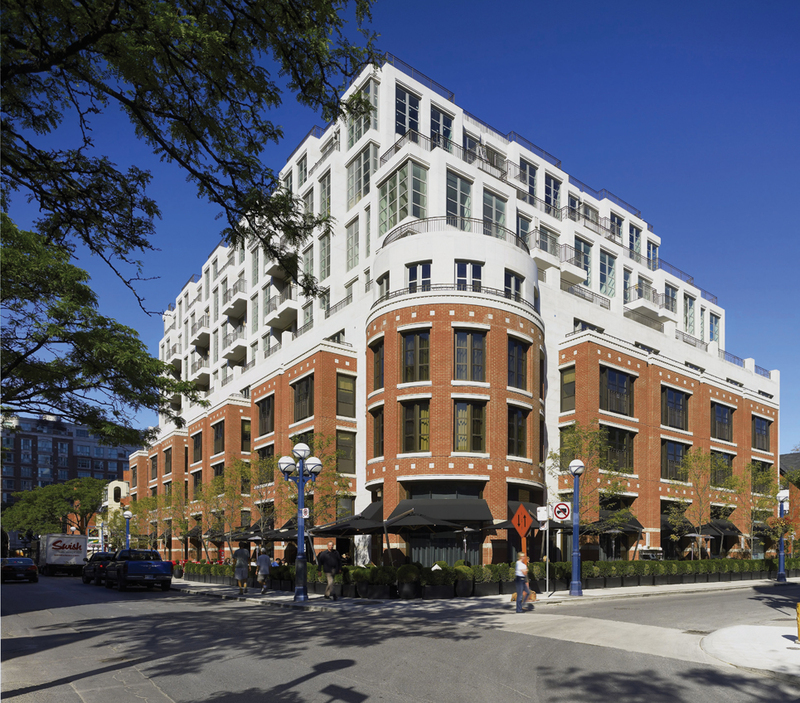 It is located at the north-west corner of the intersection of Hazelton Avenue and Yorkville Avenue, in the fashionable Yorkville area, in midtown Toronto. The framed parking level slabs are generally 240 mm thick reinforced concrete flat slabs, with 150 mm deep drop panels over the columns. In the drive aisles and parking stalls, where the concrete in the slabs may be exposed to deicing chemicals, the twenty-eight days specified strength is 35 megapascals, with entrained air to satisfy class “C1” exposure criteria. The ground floor, in general, is a 240 mm thick reinforced concrete flat slab, with 150 mm drop panels, over the columns. At the south side of the ground floor slab, the thickness was increased to 450 mm to pick up the loads in the front elevation columns. The ground floor slab concrete was specified to have a strength of 30 megapascals at twenty-eight days. The second floor is a series of 200 mm thick, one-way reinforced concrete, slabs spanning between more than sixty transfer beams, mostly either 900 mm or 1000 mm in depth. The third and fourth floors are the two upper levels of the hotel and are, for the most part, 200 mm thick, one-way reinforced concrete slab, spanning between the party walls of the hotel suites. The fifth floor, which is the first private residence level, is also a series of 200 mm thick, one-way reinforced concrete slabs, spanning between the party walls of the hotel suites below. The sixth through to the eighth levels, which contains four residences each, with two private elevator shafts, are similar 240 mm thick reinforced concrete flat slabs, with 150 mm deep drop panels over the walls and columns. The ninth level, which contains two residences, with two private elevator shafts, is also a 240 mm thick reinforced concrete flat slab with 150 mm deep drop panels over the walls and columns below. Above the two ninth floor residences, there is a 240 mm thick reinforced concrete flat slab, with 150 mm deep drop panels, over the columns, designed to carry the mechanical equipment and the masonry walls of the mechanical penthouse. Lateral forces resulting from wind or seismic effects are resisted by the two private elevator shafts and the central core, containing the fire fighters elevator shaft, and a scissor stair, interacting with four major shear walls below the ninth floor to the fifth floor and then with two reinforced concrete stairwell walls from the fourth floor down to the mezzanine level, and an additional two elevator shaft from the fifth level down to the P3 parking level.